Balram Chainrai, the man trying to become Portsmouth's owner for the third time, has described a fans' bid for the club as having "no substance". The Hong Kong-based businessman also claimed his firm, Portpin, was the only bidder with the "experience and money to return Portsmouth to its glories". He said a Pompey Supporters' Trust (PST) bid would fail due to "in-fighting and lack of actual money". "You can't run a business like that," Chainrai told BBC Sport. He did, however, admit to being unsure whether Portpin would pass the Football League's "owners' and directors' test", a necessary step if Pompey are to continue to play league football under his control. Colin Farmery, spokesperson for PST, said: "I am a bit bemused by Mr Chainrai's statements. The last time we heard from the administrators there were no issues in terms of our bid stacking up financially - and the Football League has made it clear they have no issues either. "As for 'in-fighting', nothing could be further from the truth. PST has been consistent throughout in our belief that we offer the best deal for creditors and the club. We are completely united in our goal." That objective was in sight last week when PST appeared to be on the verge of being named as administrator Trevor Birch's "preferred bidder" last week, but the trust has heard nothing from his firm PKF since Thursday. That has led to rumours that the administrators have decided to hand the club back to Portpin, meaning Chainrai would become owner for the third time since February 2010. "PKF weren't able to confirm PST as preferred bidders because its offer has no substance," Chainrai said. "[PKF] realised that once you start the due diligence on the trust's offer, there is no actual money in place and there are about 30 of them all trying to run it. You can't run a business like that. "We have the money and experience needed to take the club back where it belongs." The issue of Portpin's experience at Portsmouth, however, could work against Chainrai. For most fans, community leaders and the local media, he personifies a fall from grace that saw the 2008 FA Cup winners change hands four times in the 2009-10 season and become the first Premier League team to enter administration. Portpin controlled Portsmouth's parent company at the time of this dramatic financial collapse, and it was Chainrai who appointed an administrator to halt an HM Revenue and Customs winding-up petition. 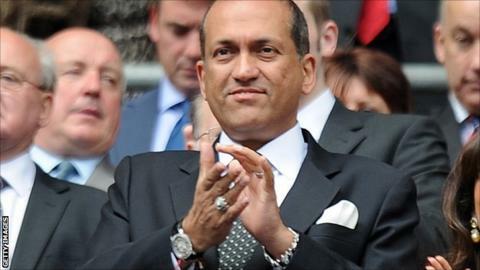 Describing himself as a "reluctant owner", Chainrai claimed he was only acting to protect his "investment", a £17m loan - secured against the club's assets - to former owner Ali Al Faraj. In October 2010, Portsmouth, now shorn of a large chunk of its £135m debt, emerged from administration with Portpin in charge again, only for Chainrai to sell the club in June 2011 to Russian businessman Vladimir Antonov. Six months later, Antonov was arrested for alleged bank fraud and the holding company he used to buy Portsmouth was placed in administration. Within two months, the club also entered administration. The supporters' trust alleges Portpin controlled this process, too, which means it falls foul of the owners' and directors' test - a rebranded version of football's infamously ineffectual fit and proper person test. Under the new system, anybody who has been a director of a club that has suffered two insolvency events since June 2004 - or two clubs that have had an insolvency in that time - is disqualified. So far, the Football League will only say it is in talks with Birch about the legal status of the respective bids, but the "next stage is for him to select a preferred bid for the board to consider formally". Pressed on this by the BBC, Chainrai said he had heard "the same rumours of people claiming this and that" about the post-Antonov administration, but denied Portpin had anything to do with it. "They can't pin that on us, and the club directors [at that time] know it. We were totally distant," he said. But his claim runs counter to details PST has sent to the Football League. "Portpin's past actions have caused the club to twice go into administration, which is why we have written to the Football League formally on this matter now the time for them to make a decision is coming closer," said PST spokesman Farmery. Former chief executive David Lampitt, now chief executive of Supporters Direct, the organisation that promotes community ownership of sports clubs across Europe, is believed to have made it clear that Portpin was the primary mover in Portsmouth entering administration again. This would appear to put the Football League on a path to a legal dispute with Chainrai, a well-worn route some PST supporters believe is behind PKF's sudden change of heart towards Portpin as well. With Portpin's strongest card being the mortgage it holds on Fratton Park, any move to take it from Chainrai was likely to end up in the courts, an expensive business for an administrator under pressure to secure the best return for creditors and his partners. For his part, Chainrai says he is willing to spend whatever it takes to get Pompey back up the league ladder. "The club has no value in League One. Everybody knows that," he said. "So I'm going to put money in to return them to their glories and then sell the club. But who knows? I might enjoy it so much I won't sell it. "I'm not reluctant anymore. I've changed my mind."